Charleston was the top city in the country in the fourth quarter of 2017 for growth in the number of businesses, according to an analysis by Yelp. The online review company credited the region’s population growth and ongoing construction boom for the high ranking. 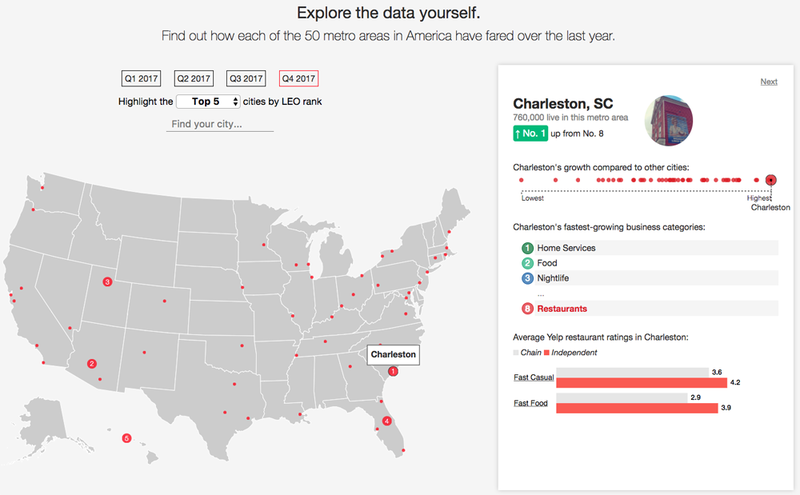 Carl Bialik, Yelp’s senior data science editor, said what struck him is that Charleston’s growth has been consistent for more than a year. This is the second Local Economic Outlook that Yelp has done. The first, which came out in October after the end of the third quarter and placed Charleston at No. 8, focused more on the closure of businesses. The most recent report still examines closings but weighs closings evenly with openings. This report also adheres more strictly to U.S. Census Bureau locales instead of Yelp’s own definitions, which Bialik said allows the report to be compared with other data that uses Census Bureau-defined areas.